It’s just a few more days until Christmas, so I might as well do a run-down of some of the holiday media I’ve consumed. I’d seen all of these previously, but not that recently, and I don’t think I’d written about them before. And there are spoilers for all three, so proceed with caution. Mixed Nuts – This 1994 holiday film had a lot of famous comic actors: Steve Martin, Madeline Kahn, Juliette Lewis, Adam Sandler, Rob Reiner, Garry Shandling, and even a bit part for Jon Stewart. Yeah, that’s a lot of Jewish actors for a Christmas movie. It was also a major box office flop. Perhaps Roger Ebert was right when he said it had “too much talent” and “too many clowns”; when pretty much every character is wacky and over-the-top, it can result in a lack of focus. I didn’t hate it, although I didn’t love it either. The plot involves Martin’s character running a suicide prevention hotline but being unable to pay the rent, so his landlord is evicting him. Several people with their own stories, including a constantly bickering couple about to have a baby and Sandler’s goofy ukulele player. An accident results in the landlord being shot, but when they’re about to be taken to the police station for custody, they find out he was a serial killer and instead reward Lewis, the one who fired the shot. It’s not a plot point that makes a lot of sense, as there was still a homicide even if the victim was a criminal, but realism is not the movie’s strong point. The way Leiv Schreiber’s transsexual character was treated was also pretty messed up, with the homophobic interactions Martin has with him. Yeah, one of his defining character traits is that he’s very sympathetic on the phone but terrible in face-to-face interactions, but still. It was pretty common for the time, though. Christmas Eve on Sesame Street – It must have been around 1984 that I first saw this, and I don’t think I’d seen it since then, at least not in its entirety. I’d been wanting to see it again anyway, but I was especially reminded me of it by the recent Kevin Geeks Out show that ended with a clip of Oscar the Grouch falling down multiple flights of stairs. It was originally shown in 1978, but when I saw it a few years after that, it seemed pretty current in terms of the characters used. The weird thing is that Mr. Hooper, who played a significant role in the special, must have already died by the time I saw it, but I don’t think I was aware of that then. 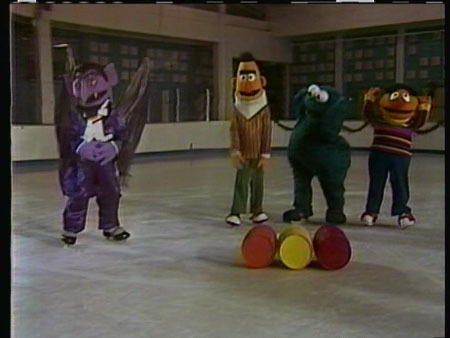 It starts out with a long sequence of some kids and Muppets going ice skating, including Big Bird, Oscar, Bert, Ernie, Cookie Monster, and the Count. It’s weird to see these characters with legs (well, except Big Bird, who always has them), and the Count is also wearing bat wings. It’s also the only time we see him. After Oscar falls down the stairs (he expresses a desire to go back and do it again, although apparently the original line before post-production edits was “Sure, I’ve been thrown out of better places than that”), he trolls Big Bird by asking how a fat Santa Claus can go down skinny chimneys, suggesting that there won’t be any presents if he can’t. Big Bird is distraught by this, and recruits Kermit, Grover, and Mr. Snuffleupagus to try to figure it out. Apparently no one thought of how Oscar, who made the suggestion in the first place, lives in a trash can that defies physics. He’s had an elephant in there before. Bert and Ernie’s subplot is a take on “Gift of the Magi,” with Bert trading his paper clip collection to get a soapdish for Ernie’s Rubber Duckie, and Ernie trading the Duckie for a cigar box to store the paper clips. It has a happier ending, though, as Mr. Hooper decides to give back the things they traded AND keep the new things. It’s briefly acknowledged that Mr. Hooper is Jewish, but apparently nobody else in the neighborhood is. Tavie pointed out something I hadn’t really thought of but is totally true, how difficult it must have been to show puppets opening presents. Meanwhile, Cookie Monster tries to ask Santa for cookies, but ends up eating a pencil, typewriter, and telephone in turn. He ends the last scene with the cord still hanging out of his mouth; I had thought there was a bit where he pulled in something from the other end of the line, but I must have been mixing it up with something else. And Bob sings the original song “Keep Christmas with You” with some kids, also performing it in sign language so Linda can appreciate it. It’s a really good song that’s stuck with me through the years, and I wonder that it doesn’t get more exposure. Big Bird eventually tries to stay on the roof to see Santa, but falls asleep and gets really cold, so he has to go back inside. At Gordon and Susan’s apartment, he finds that Santa has already been there, and Gordon tells him it’s a miracle that doesn’t need an explanation. I can appreciate that to an extent, but shouldn’t kids be encouraged to analyze things and find them out for themselves? I guess not if it involves freezing on the roof. Incidentally, the show does address a question I had, why Big Bird got so cold on the roof when his nest is outside anyway. Maria explains this to Oscar by saying he has an electric blanket and heating pads. I wonder where he gets the electricity. Anyway, this was very nostalgic for me, and I’d say it still holds up. 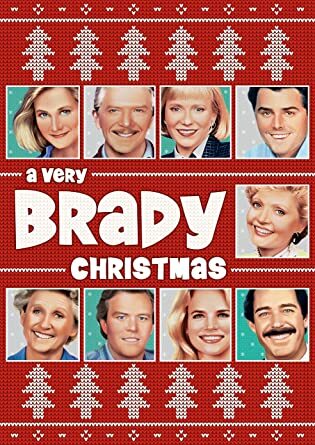 A Very Brady Christmas – Beth tells me that The Brady Bunch is something she started out watching ironically, but then got to genuinely like it. That kind of thing happens sometimes. This 1988 special was a reunion of sorts for the original cast, except for Susan Olsen (she was allegedly on her honeymoon at the time) and Allan Melvin (who played Sam the Butcher). It even acknowledges the short-lived The Brady Brides, where Marcia and Jan marry a laid-back guy and an ornithology professor, respectively. And everyone is hiding secrets: Marcia’s husband has lost his job as a toy salesman, Jan and her husband are splitting up, Cindy wanted to go on a ski trip with her college friends (she doesn’t mind canceling it so much as the fact that no one even asked her), Bobby dropped out of business school to become a race car driver, Greg’s wife always spends Christmas with her family, and Peter is dating his boss. Okay, those last two aren’t really secrets, although in the latter case the issue for him is that he’s upset she makes more money than he does, which isn’t something I’ve ever really understood. That’s one of those masculine stereotypes that isn’t at all beneficial to men. It’s not even brought up that this could be a conflict of interest, because apparently that wasn’t a thing in the late eighties. Also, Sam has left Alice for another woman, but he comes back at the end and nobody seems particularly mad at him. What kind of lesson is that? You can cheat on your wife as long as you regret it afterwards? And Mike has designed a building for a wealthy client who wants to go against his recommendations and use the minimum safety supports required by law, which results in the building in progress collapsing around two security guards. Remember, this was the era of deregulation. Mike shows up to rescue the guards, because…apparently that’s a job for an architect? Is that, like, something that ever happens? Also, calling Christmas specials “A Very [Blank] Christmas” is a cliché, but it’s one where I can’t think of too many sincere examples. Maybe this one started the trend? I don’t know. This entry was posted in Christmas, Holidays, Humor, Muppets, Music, Relationships, Sesame Street, Television, VoVat Goes to the Movies and tagged a very brady christmas, adam sandler, bert and ernie, big bird, christmas eve on sesame street, cookie monster, count von count, garry shandling, grover, jon stewart, juliette lewis, kermit the frog, madeline kahn, mixed nuts, mr. hooper, oscar the grouch, rob reiner, santa claus, steve martin, the brady brides, the brady bunch. Bookmark the permalink.